Switching survey vendors can be intimidating. What will happen to past survey data? How can I easily transition my team? Is there something I’m forgetting? Stop right there! This ebook will ease your worries. Moving to a new employee survey company doesn’t have to be a messy, complicated, or painful process. 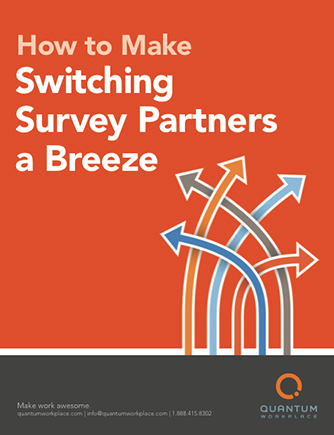 Our guide, How to Make Switching Survey Partners a Breeze, takes you step by step through the decisions you’ll need to make and what you can expect. Timeline: How much time do you need to evaluate vendors? Transfer data? What are your options for dealing with past survey data? Survey items: Keep the old ones or adopt new ones?